NETWORK FINALS: NBC’s NFL game adjusted to 6.6. 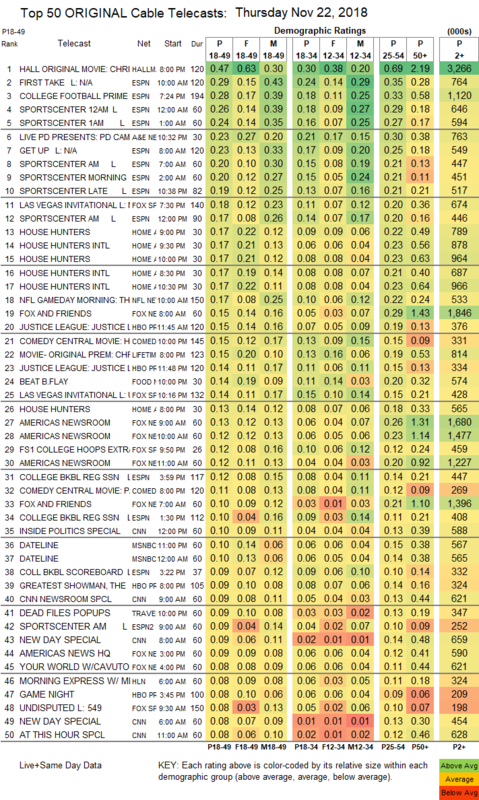 In addition, after adjustment for FOX’s late afternoon game, MASTERCHEF JR adjusted down 0.2 to 1.7. CABLE HIGHLIGHTS: On a sports- and rerun-heavy holiday, the top show on Thanksgiving cable was Hallmark’s movie CHRISTMAS AT THE PALACE at 0.47, while Lifetime’s movie THE CHRISTMAS CONTRACT was at 0.15. ESPN’s COLLEGE FOOTBALL game was at 0.28. A&E’s LIVE PD: PD CAM was at 0.23, compared to last week’s 0.26/0.25. Food Network’s BEAT BOBBY FLAY dropped 0.07 to 0.14. 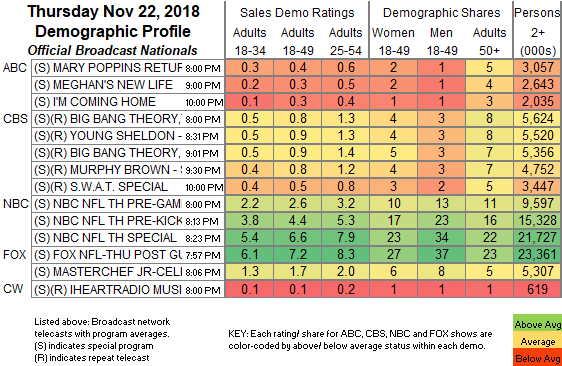 POP’s IMPACT WRESTLING gained 0.02 to 0.03.